What in the world is Dzongkha? At Simtokha school children study seven hours a day, six days a week. There they learn English along with their native language, Dzongkha. Until recently, the written language of Bhutan was classical Tibetan. The previous King decided that Bhutan should have its own written language corresponding to their native spoken tongue. The King then started a school at Simtokha for the training of Dzongkha teachers. 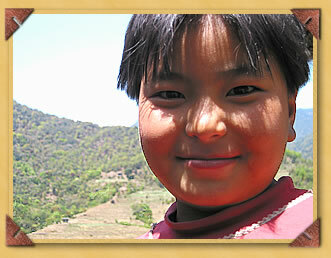 Now children at Simtokha study modern subjects alongside the ancient traditions of their Bhutanese legacy. Fifty percent of the world's spoken languages, along with their traditional cultures, are expected to vanish in the next hundred years. Simtokha's unique approach to education in Bhutan is paramount if this kingdom's special perspective on life is to survive. I took this photo in the twilight outside Simtokha's open courtyard. I think the flash startled them! Today Simtokha Dzong houses hundreds of children, many of them orphans, providing them with both a traditional and modern education. Simtokha Dzong was built in 1627 by Shabdrung Rinpoche. It is situated high on a ridge just south of Thimpu, Bhutan's capital. Simtokha is presently the home of the Institute for Language and Culture Studies. These children are Bhutan's hope for the future.